You will be given a reference e-book to read which has 266 pages And the test will be based on that e-book , you can take final test within 1 year of purchase. Wastewater treatment refers to the process or the act of taking wastewater and working hard to make it more suitable to be discharged back into the human environment. Various activities can actually form wastewater including using the toilet, bathing and washing. Wastewater even includes rainwater runoff. Regardless of the sources of wastewater, it should be noted that this type of water is filled with contaminants, chemicals and bacteria. This is the main reason why you need to treat it to reduce its contaminants to more tolerable levels so they can be discharged safely into our environment. It should be noted that treating wastewater encompasses numerous steps that work in filtering, cleaning and clarifying it from beginning up to the end. One of the most useful methods used in wastewater treatment is the preliminary treatment which works by screening out any coarse solids including plastics, rags and rocks and grits such as sand and gravel and then sending them into the landfill. Primary treatment is also performed and this works by screening out wastewater with the help of rudimentary treatments as a means of removing crude solids and skimming off oil, fat and grease. Biological or secondary treatment is also conducted and this is characterized by getting rid of organic substances that greatly demand oxygen by utilizing bacteria as a means of converting organic matter known for being degradable into bacterial cells. The highly comprehensive wastewater treatment certification program which is now one of the most detailed and updated online certification courses offered by Brainmeasures is ideal for you if you have longed to master everything about wastewater treatment. You will never regret enrolling in the wastewater treatment course offered by Brainmeasures since it gives you the opportunity to understand everything about this vital topic. Brainmeasures can supply all the participants of this program with a wastewater treatment training which works in explaining in full detail everything about the topic including how wastewater treatment works, major sources of wastewater, major reasons why you need to treat it, the different methods, techniques and technologies that you can now use for the wastewater treatment process and the many things that you can do to safely bring back wastewater into the environment. Earning a wastewater treatment certificate is extremely beneficial for you since this will serve as an evidence of your skilfulness and proficiency in the field. 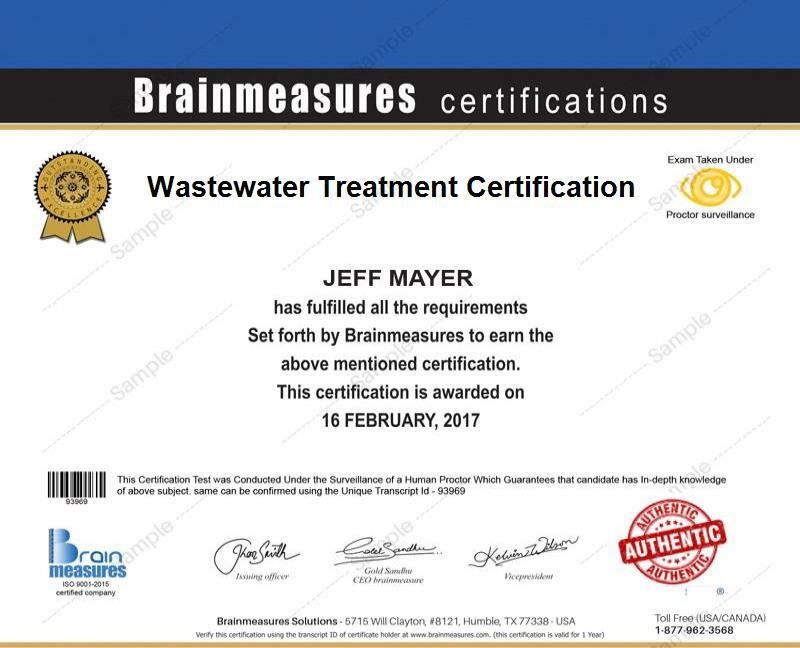 The proven comprehensiveness and reliability of the wastewater treatment certification program offered by Brainmeasures makes it highly beneficial to numerous individuals and professionals. Enrolling in this program can benefit all aspiring and practicing wastewater treatment system operators, engineering managers, environmental managers and all other individuals and professionals who are tasked to perform certain functions that are related to wastewater treatment. You will also enjoy the outcome of completing a wastewater treatment certification course since it improves the level of your salary. Working as a wastewater treatment consultant after earning a wastewater treatment certification is rewarding because it lets you earn an average annual salary of $64,000. Working as a wastewater treatment system operator is also rewarding considering its ability to let you enjoy an annual salary of around $43,000 to $80,000 per year.